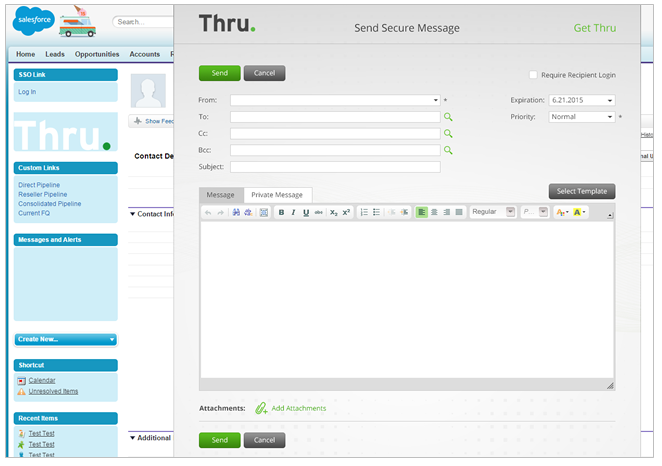 Thru is a secure file sharing and collaboration platform designed specifically for businesses. It allows business users to easily share large files and collaborate securely with internal employees as well as your customers and partners. With Thru, you can access, manage, and send files or folders from a variety of applications (like Office 365, Outlook, Salesforce etc.) anywhere, anytime and from any device. 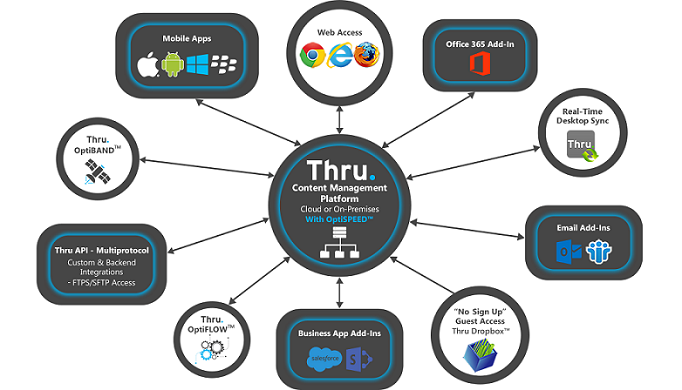 With Thru, you can easily access and manage your online content from any device. You can choose to share content with any member of your Thru site by modifying access settings for each of your folders. Example 2: Use Thru Mobile Apps to open and edit files from your iOS and Android devices. 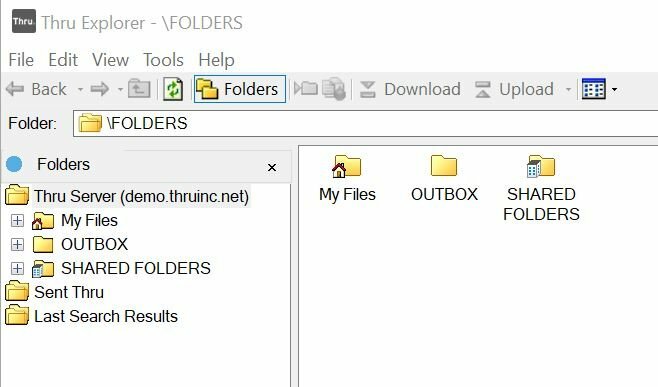 Example 3: With the Thru Explorer desktop app, you can access your Thru files and folders directly from your desktop without signing into your browser. You can get Thru Explorer when you download either of Thru’s email add-ins: Add-In for Outlook or the Add-In for IBM Notes. To download Thru Add-Ins, go here. Example 4: Work within your mailbox with the Side Panel feature of Thru’s Add-In for Outlook. 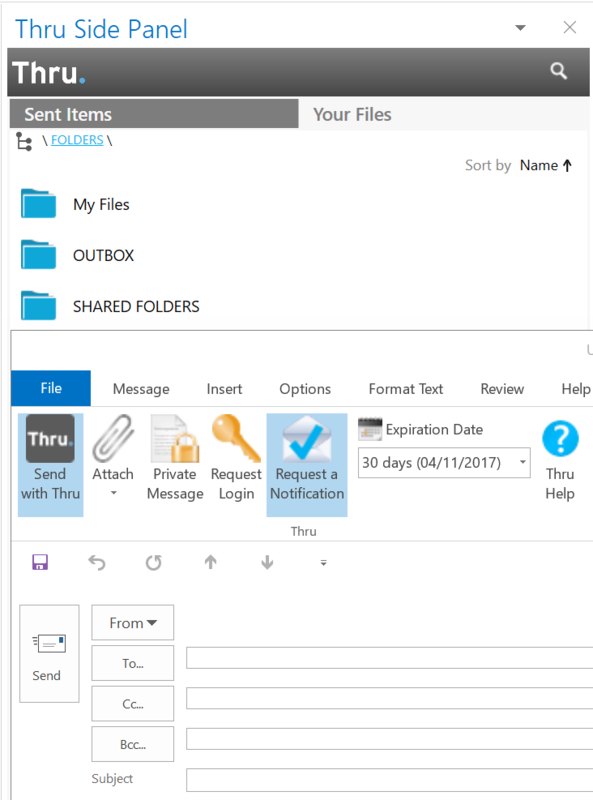 With the Side Panel, you can upload and download files to and from your Thru file system, send files to team members, drag and drop Outlook emails, and more. With Thru, you can send large files and folders securely from your desktop, web browsers, business applications and email clients. You also have the option to request recipients to login to download files, set an expiration date, and more to increase security and policy-driven access. To download Thru desktop apps and Add-Ins, go here. Example 1: Send files from any web browser with the Thru Web app. 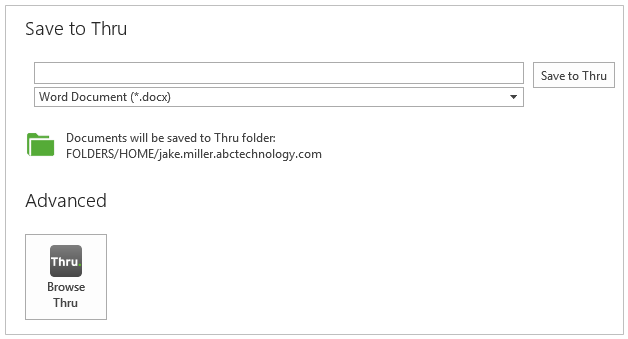 Example 2: Send email attachments of any size using Thru’s email client add-ins. 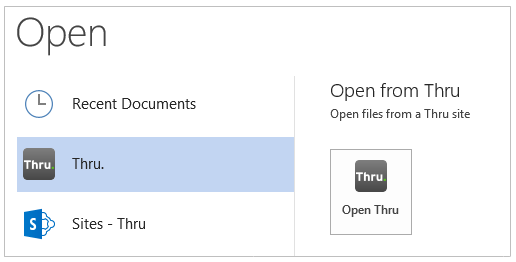 Example 3: Protect your SharePoint documents by using the Thru Add-In for SharePoint. 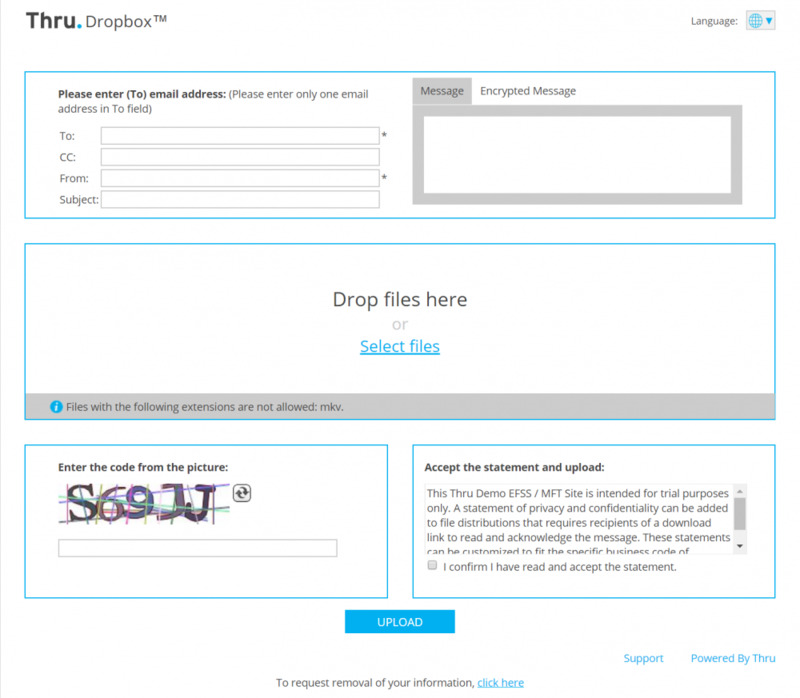 Example 4: Send sales files securely by using Thru’s Add-In for Salesforce. To add the Thru Add-In for Salesforce to your Salesforce account, contact your Thru Administrator. If you need to securely receive large files from users without a Thru account. You can create a link to your Thru Dropbox and make it available from email signatures, web portals, and anywhere that supports hyperlinks. When users upload files to your Thru Dropbox, you receive an email notification letting you know that they have dropped files in your Thru Dropbox folder. To learn how to create a link to your Thru Dropbox, go here. 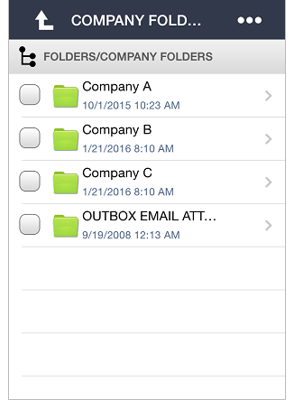 Download Thru’s native mobile apps to access, manage and send files on-the-go. You can also access your Thru site from any device via mobile web browsers. 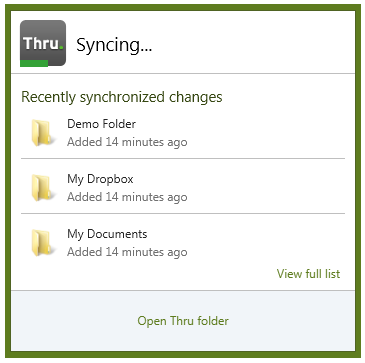 You can sync Thru folders to your Windows desktop by using the Thru Desktop Sync app. This is a great way to always have the most up-to-date files right on your desktop instead of manually downloading them every time from the web. To add Thru Desktop Sync to your desktop, contact your Thru Administrator. With the Thru Add-In for Office 365, you can create and edit Office documents without leaving your Office applications. The add-in works with Microsoft Word, Excel and PowerPoint and allows you to edit documents that are stored in Thru or create new files and save to Thru. To get the Thru Add-In for Office 365, contact your Thru Administrator.